bl.uk > Online Gallery Home	> Online exhibitions	> King George III Topographical Collection	> London 57-3. 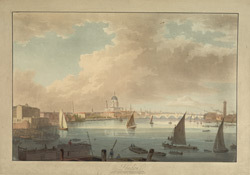 Artist and engraver: Pickett, W.
An attractive view on the river of London, showing St Paul's Cathedral and Blackfriars Bridge This was the third bridge to be built to cross the Thames, this time between Blackfriars and Southwark. It was built between 1760-9 at a cost of £230,000 and its architect was Robert Mylne. It was originally called William Pitt Bridge but became more commonly known as Blackfriars Bridge. In 1785 the tolls for use of the bridge were removed.